Naperville Garage Door Repair, Naperville Garage Doors | Overhead Garage Door, Inc. If you’re experiencing a garage door problem, you don’t have time to wait for a repairman to fit you into their schedule. Call us right now and get superior service for your broken or damaged garage door. We don’t make you sacrifice your home’s safety – we come to your aid immediately. Our garage door repair experts in Naperville are knowledgeable and trained to fix even the toughest of garage door cracks. We offer a free estimate and will let you know exactly how much your garage door repair will cost before we begin working. Our experts answer your call any time of day or night. We visually examine your garage door in person. You get a free estimate after we review the damage. Our Naperville garage door repair team gets right to work. We make it simple to get your garage door fixed – no trips to the home improvement store or waiting for an appointment that might not happen for weeks. We only work with the most excellent craftsmen in the business, so rest assured, you’re getting the best for your garage door in Naperville. 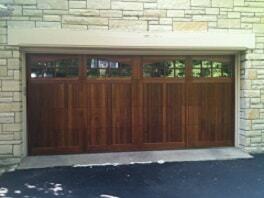 Garage doors are vital to your family’s safety, and they can also vastly increase the curb appeal of your home. 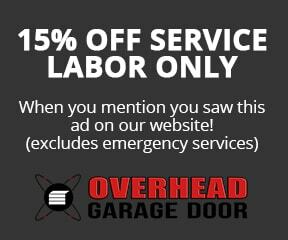 Since 1981, Overhead Garage Door has been putting our customers first by providing reliable services at affordable prices. We are on call 24/7, and our trained specialists are ready to meet all of your garage door needs at your home in Naperville. Whether you need a new installation completed, your existing garage door must be repaired or replaced, or your garage door opener has malfunctioned, we can help. If you’re looking for a garage door repair company that has you covered for all of your garage door repair and installation needs, trust the industry-leaders and call Overhead Garage Door today. “An actual human being on the other end of the phone. And she knew what she was talking about. What a novel concept! Thanks, Lanette B.” – Stacey H.
“Paul R. is a pro’s pro. The guy knows what he’s doing.” – Alex S.
“We had a terrible accident that caused considerable damage to our garage door. Scott K. arrived promptly, assessed the situation, thoroughly explained to me what needed to be done, and made the necessary repairs. Thanks, Scott, for the great work!” – Erin C.
“My door was installed yesterday and it turned out great. You really hit it out of the park with Matt, as I’m sure you already know, you couldn’t find a better rep for your company.